Dear friends, I was walking Esther down the street on a hot yesterday and kept stepping into the shade. I’m looking for the shade in every moment, I thought. I’m not drawn to the fiery hot aspect of ideas, people, attractions or emotions. I’m leaning into the cooler, quieter perimeters of observation. Especially in my creative work right now, where there is plenty of heat in the content of what I’m writing, I keep edging into the shady spots. Because I don’t want to get burned. I’m realizing the difference between safe and unsafe, and I don’t even want to be singed, or singe another. I see what is worth risking, and not worth risking. My children are worth risking everything for, and so is my creative work, but neither at the expense of the other. With my friends, when heated subjects come up, I stray into the leafy coverage of my mind, the protection of the tall buildings surrounding my heart. Dashiell called me “Mellow Fellow” walking home from a sunset the other night, but that’s only on the outside. I am allowing myself to hush, and go down to my streams where new ideas are trickling out of moss covered rock beds. I am letting the waves crash and the fires blaze above me and I’m still going deeper into my shade. I need from myself. I need to find the well. I need the time to drink from my well and fall asleep by it and let my unconscious sprout the words, the phrases, the images that tell the story I’ve been wanting to tell my whole life. It’s not a story about me, it’s a story about a girl like me, a girl I was almost best friends with, but she scared me and I ran away from her. That’s what I’m doing. My neighbor said of his new born daughter, “she has nothing but time.” I’ve remembered that moment for years, because I thought, “So do we all, nothing but time to grow until we die.” But it doesn’t seem logical, it feels like we are running out of time, but even if we are, it’s still all we have, because when it’s gone, we’re done. 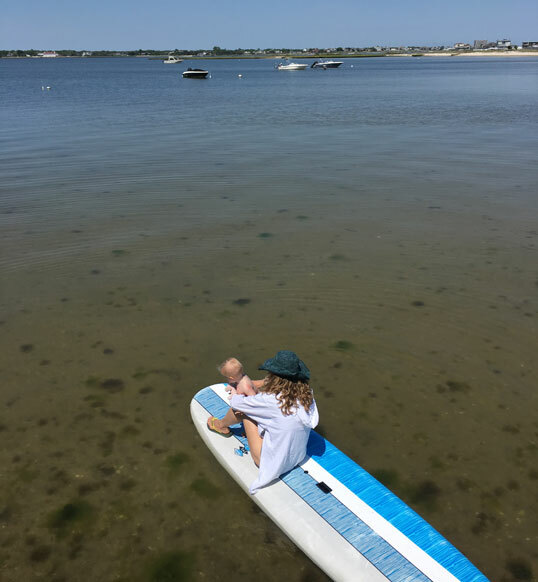 So time to choose, as I just did, to go out with my children on the paddle board, instead of write. Time to sleep inside, or as I did last night, to trade sleep for watching the ever changing canopy of our solar system wrapped in dewey blankets with my son. Time to go to the sunset, as we say, to stand on the edge of our day and watch the earth under our feet literally turn away from the sun. Dashiell said, what if the sun burns out? We die. And when I lay next to him trying to figure out how to tell East from West by the stars, I imagined what if this night were the last time we saw the sun? It was a scary feeling, so when I woke up in the grey blue mist of dawn I felt overjoyed. I felt relief and sweet giddiness that we turned toward our sun again, and I wondered if that appreciation is what many people used to feel, when we were more connected to our natural world, and what now only some people feel, when they’ve escaped death or transcended the pain of being alive. What we do with our time can balance us as we grow, or plummet us into neurosis. And what we do has to change, as we change, as our environment changes. I need, I wrote, from myself more than anyone. Yet my children need from me, probably more than anyone. My daughter especially, my son less and less, but still. What a balance, it reminds me of a Chinese acrobat we watched at the Public Library last night, so much energy was used to balance the parts of herself that she appeared inhumanly calm. I appear that way, I’ve been told, but it’s more the awareness of not wanting to hold precious time over the flame, and burn it up. I have had great shows, particularly in this last year. I feel it’s because of the new material, how I’ve grown into the new songs that tell a new story in new ways, and also my appreciation of you who come to listen. It’s like I woke up in the grey blue mist and there you were, the sun. I do have the new cycle of songs ready to release, and that means I have to reach out and find ways to deliver them to you and other people who are curious. I love the recordings. You’ll hear more about this soon. I feel I have reached a certain status. The status of a strong, tall tree. My branches reach up to heaven with equal strength to my roots, bearing down into the dirt. I hope I see you soon, all we have is time to grow.